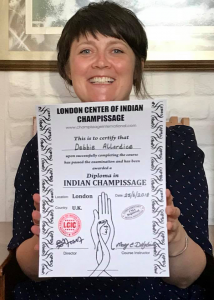 I recently achieved my diploma in Champissage, a special form of Indian Head Massage developed by the late Narendra Mehta, an MBE winning therapist who is credited with bringing Indian Head Massage to the UK back in the 1980s. This therapy focuses on the shoulders, upper arms, neck, head and face, relieving muscular tension and promoting a more relaxed state. I took the training course while I was pregnant with my second baby; I had a real drive to learn and expand my therapy skills before the baby arrived as I knew by experience that everything would be turned upside for a while afterwards! During that time I also gained my qualifications in Thai Foot Massage and Facial Rejuvenation (Natural Facelift) Massage. Almost immediately after the Indian Head Massage course, we had a series of changes in our lives. We lost some family, we had our beautiful daughter, we moved cities, started new jobs, and life took over. So Indian Head Massage took a bit of a back seat. I always had in the back of my mind that I wanted to complete my course, be qualified and start offering this wonderful therapy. Finally in September 2017 I was able to restart my case studies and, with determination and grit, completed my case studies and exams in June 2018. To achieve the diploma, I had to complete 25 case studies on five clients and report on my findings. My final exams included both practical and theory; carrying out a complete session on my tutor, and a theory paper that included the anatomy and physiology of all the bones and muscles in the shoulders, arms, neck, head and face, and the physical and emotional benefits of the treatment techniques. My tutor, Mary Dalgleish, a wonderful teacher and very experienced practitioner, has encouraged me to share my case study findings, and so below is the summary of my case studies, undertaken over the last nine months. Here’s the photo of me immediately after passing my exams and achieving my diploma – I was absolutely delighted! I took the Indian Head Massage course back in 2014 when I was pregnant with my second child. I started my case studies in 2015, but work, juggling the two kids and moving city to Bristol in 2016 saw me restarting my case studies in earnest in 2017. Starting with my client ‘P’ in Sept 2017, my technique felt quite clunky. As I’ve been a practicing therapist for a few years now, learning a new skill and a new therapy can sometimes feel strange when I’m used to having fluidity with my other sessions. Once you’ve mastered a new skill you’re able to employ your intuition and respond to the client’s needs more readily. To help me to understand the approach for each move and the benefit and outcome intended, I referred back to the sequence and the notes during these initial sessions, which made these initial sessions feel disjointed. I bought the DVD so that I could refer back to the techniques visually, and this helped me to improve and gain a better understanding of the flow of the moves. As my memory for the order of the techniques and their intentions and benefits improved, so did the connection I had with the client’s needs; I became more able to focus on the knots and tension that the client and work with those areas rather than focussing on each individual technique. This progression made the overall treatment much more beneficial for the client but also much more rewarding for me. Feedback from clients has also helped to make small changes that make a big difference to the session; initially I was tilting back the clients’ heads back too far to perform the moves on the face. A couple of clients found their necks were stiff following the treatment, rather than more loose as I’d intended! Adjusting the positioning of the pillow to support the client’s head during the facial moves made a huge difference to their experience. I also managed to find a more comfortable chair for the clients after realising that the back was too high and the seat too rigid for some of them. As the sessions progressed and my experience built, I was able to work more intuitively and with sensitivity to the clients’ needs, and gained the fluidity in delivering the session that I had aimed for. What really seemed to connect each case study was the release of tension – physical and emotional – by the end of the session. Whilst it’s a short treatment, the clients were able to leave feeling less tense, more relaxed and often more sleepy. The more familiar with the session the clients became, the quicker they were able to relax into it. The impact on their emotional wellbeing was quite striking in all cases. This ability for the treatment to almost ‘break-down’ layers of stress and tension is worth noting, as clients may feel more relaxed but also more vulnerable at the end of the session. It would be all the more important to be sensitive and supportive to clients feeling vulnerable following a treatment. Some of the clients found that the techniques really improved blocked sinuses, relieved tension in their face and head and gave a feeling of clarity around their eyes. The neck and shoulder tension that everyone seemed to have was so indicative of a commonality of computer use and desk-based work. I would think to extend the sessions for people who had a big build up of tension in these areas so that I could focus on breaking this down over a course of treatments. What is wonderful about this treatment is that it is short enough to be accommodated during a break from work or on an evening, with benefits that will last several days. I’m really looking forward to offering this fantastic new treatment to my clients. 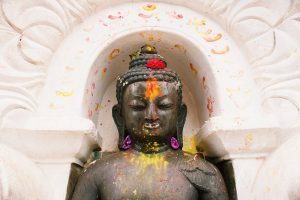 > If you’d like to come and try the wonderful benefits of Indian Head Massage, book a session with me at the Wells Road Osteopaths in Knowle or the Centre for Whole Health in Bedminster.